The good news out of Alabama for President Donald Trump on Tuesday: His candidate lived to fight another day. The bad news: That candidate enters a runoff for the Republican nomination to fill the Senate seat vacated by Attorney General Jeff Sessions as the prohibitive underdog against conservative jurist Roy Moore. The question now: Will the president expend political capital trying to help “Big” Luther Strange, the six-foot-nine appointed incumbent? Campaign advisers tell NBC News they expect Trump to hit the trail for Sen. Strange in the next six weeks ahead of September's runoff, and Strange has invited all the help from the president he can get. Yes, Trump has star power still, at least in Alabama, which sports some of the most friendly political turf for the president anywhere. His approval rating in the state is 55 percent, well above his national score, and 85 percent with Republicans. 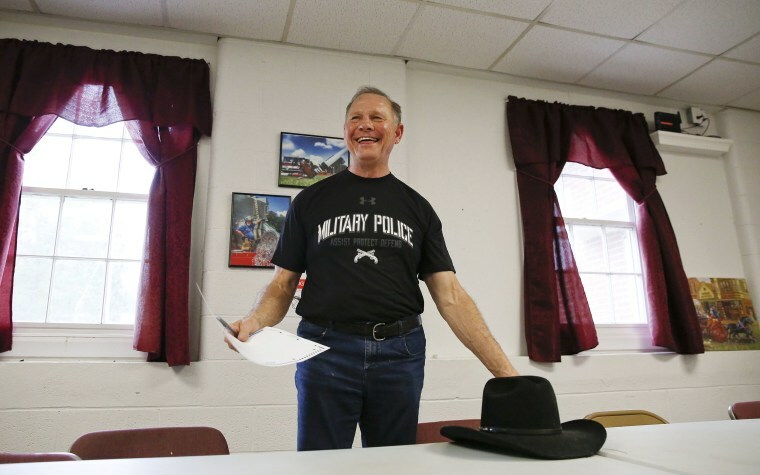 Last November, he won 62 percent of the vote in Alabama, and in the March 2016 GOP primary, he swept every single county. His endorsement was coveted by all of the candidates, and a senior Alabama official called it a "big" moment when he chose Strange last week. This isn’t a natural match. Trump’s appeal is populist, rooted in his sneering, antagonistic posture toward the establishment, and political norms in general. Strange, though, pretty much embodies the establishment. He’s a former state attorney general who owes his office to an appointment from a deeply unpopular governor, Robert Bentley, who has since resigned from office in disgrace and pled guilty to two misdemeanors. And he’s running now with the backing of Senate Majority Leader Mitch McConnell, a reviled figure among the grassroots. Trump promoted Strange on Twitter and in recorded phone calls, but it seems like many Republicans just didn’t buy it. The areas where Trump fared best in last year’s presidential primary tended to go decisively on Tuesday for Roy Moore, who finished first overall. Strange fared best in Birmingham and its suburbs, where Trump wasn’t as strong. The president failed to start a grassroots fire for his candidate in the preliminary election. He finished seven points ahead of Strange on Tuesday, so he enters the runoff with more built-in support. More importantly, he’s a better match for supporters of Rep. Mo Brooks, R-Ala., who finished in third place with nearly 20 percent of the vote. Brooks’ vote was heavily concentrated in the northern part of the state, in the very conservative 5th District, which he now represents in Congress. Brooks, like Moore, railed against establishment politics in his campaign; it’s conceivable he might have won Trump’s endorsement if he hadn’t disparaged him personally during last year’s presidential primary, when Brooks backed Sen. Ted Cruz, R-Texas. Moore has been waiting for years for a moment like this. In 2003, when he was the Chief Justice of the state’s Supreme Court, he defied an order to remove a monument containing the Ten Commandments from state property. It made him a hero to conservatives nationally, and for a while it looked like he’d ride the momentum into the governor’s office in 2006. But his primary challenge to then-Gov. Bob Riley fell apart — a missed opportunity for an ambitious politician. He tried again in 2010, but missed the runoff by a few points in a crowded Republican primary field. Now 70 years old, Moore now looks like he has the inside track to the Republican nomination for the Senate — which probably means he has the inside track to a seat in the Senate. In early 2010, Massachusetts looked as out of reach for a Republican candidate for Senate as Alabama now looks for a Democrat. And yet, Scott Brown pulled off one of the all-time stunners in a special election that January, knocking off Martha Coakley. Could Democrats return the favor in a deeply red state, all these years later? They got the candidate they wanted Tuesday night. Doug Jones, a former U.S. attorney, showed how unreliable polling can be, easily winning a Democratic primary that was thought to be close. Democratic leaders believe he could make noise in the December general election if the controversial Moore does win the GOP nomination. But it’s hard to overstate what a long shot this is for Democrats. Their modern track record in Alabama is rough enough; since 1996, Republicans are undefeated in Senate races in the state, and only one has even been competitive. The bigger problem for Democrats, though, is that voting patterns in the deep south are highly polarized along racial lines, especially when it comes to federal office. To win the seat, Jones would have to capture a share of the white vote that may well be out of reach for a Democrat in the Trump-era South.